An early notification incentive was approved by the BISD Board on November 14, 2017. This early notification of voluntary resignation incentive applies to non-retired/rehired employees who have served BISD for at least a minimum of 15 consecutive years at the end of the 2017-2018 school year. The Early Notification of Voluntary Resignation Incentive Packet can be found on this link. BISD takes great pride in all community outreach efforts! This is Dr. Esperanza Zendejas, BISD Superintendent. This message is for our Hanna Early College High School community. I want to reassure you Hanna Early College High School is safe and being closely monitored by the BISD Police Department. The reports received yesterday were immediately investigated and no credible threat was discovered. BISD takes every necessary measure to ensure the safety, security & protection of all our students and our campuses. La Preparatoria Hanna esta bajo la supervisión del Departamento de Policía y Seguridad de BISD despues de un reporte falso Habla la Dra. Esperanza Zendejas, Superintendente de BISD. Este mensaje es para los padres de Hanna Early College High school. Quiero asegurarles que la Preparatoria Hanna esta bajo la supervisión de nuestro Departamento de Policía y Seguridad de BISD. Los informes recibidos ayer fueron investigados inmediatamente y no se descubrió ninguna amenaza. El reporte fue falso. BISD toma todas las medidas necesarias para garantizar la seguridad y la protección de todos nuestros estudiantes y nuestras escuelas. At a special called meeting, the District-wide Education Improvement Council (DEIC) of the Brownsville Independent School District (BISD) voted by a margin of 38-12 to submit the District of Innovation (DOI) Plan to the BISD Board of Trustees. The BISD District of Innovation Plan will be posted on the BISD website for at least 30 days. 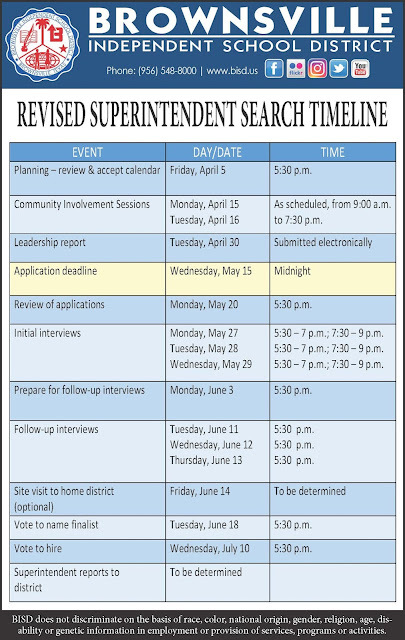 If approved by the BISD Board of Trustees, the DOI Plan will allow the BISD to propose a calendar whereby school may begin before the state mandated last Monday of August. During the regular school board meeting to be held on November 7, 2017, the BISD Board of Trustees will be asked to approve the District of Innovation Plan with a final vote requiring a 2/3 majority. In the event, the Board of Trustees approves the District of Innovation Plan, a copy will be provided to the Texas Education Agency for posting on its website. View the District of Innovation (DOI) Timeline and Plan. The BISD Fine Arts Department will present its annual Santa & Friends Program on November 29-December 1, 2017, at the Central Administrative Building (CAB) Theatre. Tickets go on sale October 30 and are $7 cash only. Children 2 and under are free. There is a limit of 9 tickets per person. Tickets must be purchased at the Fine Arts Department located at 708 Palm Boulevard. Call (956) 982-3730 for more information. Toy donations to the Annual Superintendent’s Holiday Toy Drive are welcome. View the poster for more information. The CATCH Global Foundation named Julian Salinas, a physical education teacher at Castañeda Elementary School, as a CATCH Champion of 2017 for his outstanding efforts to create an active and healthy environment for the children of Texas. Mr. Salinas is one of six CATCH Champions of 2017 at the school, district and community level across the state of Texas. The Coordinated Approach To Child Health (CATCH) Program aims to impact the healthy-living messaging children receive in physical education, the lunchroom, the classroom and at home to improve and sustain their health. Mr. Salinas will be recognized in a ceremony on November 30, 2017, in Ft. Worth. The BISD Human Resources Department has announced the enrollment period for the Employee Sick Leave Bank, October 1-31, 2017. If a BISD employee or family member has a catastrophic illness, the employee may withdraw days from the bank. New members must complete an application form and have one local day to contribute. Enrollment is automatic for current members. A form must be completed to discontinue membership in the Employee Sick Leave Bank. For more information, call (956) 548-8051 or 548-8031. Download the flyer and application here. On Saturday, September 23, 2017, Region 28 held the annual audition for the TMEA Region 28 High School Jazz ensemble. Over 110 students from High Schools across the valley competed for one of only 40 chairs available. We are proud to announce that BISD Band students earned a record total of 8 out of the 40 chairs available. BISD Band students also earned 3, 1st chair positions and 6 of the 8 students will be competing at the area round of competition for a chance to make it to the TMEA All State Jazz Band. The TMEA Region 28 High School All Region Jazz band will perform on Saturday, February 10, 2018 at the Harlingen Performing Arts Center at 4:00pm. View the list of the All-Valley Jazz Band Members.